Monday can’t come fast enough! 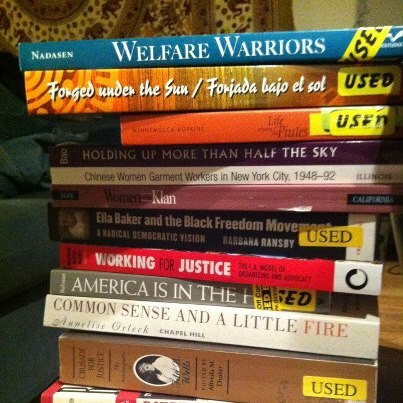 My daughter posted this photo and comment on her Facebook page after purchasing her textbooks for winter term. She is a full-time senior at a university and works part-time at an independent bookstore. Yet she can’t get enough of reading and learning. Her twin is equally passionate about learning. After seeing my daughter’s Facebook post, I reflected on what we did to encourage and support their love of learning. We survived the homework battles and our daughters are now months away from finishing their undergraduate degrees. It wasn’t always easy. We didn’t have many of the challenges that some families face, like those with ADHD, depression, anxiety, or medical problems, but over the years we found ways to support them in school. Today millions of American children grow up in homes where they don’t learn the skills they need to succeed in life. Their vocabularies are tiny. They can’t regulate their emotions. When they get to kindergarten they’ve never been read a book, so they don’t know the difference between the front cover and the back cover. . . . This is rude to say, but here’s what this is about: Millions of parents don’t have the means, the skill or, in some cases, the interest in building their children’s future. Early childhood education is about building structures so both parents and children learn practical life skills. It’s about getting kids from disorganized homes into rooms with kids from organized homes so good habits will rub off. It’s about instilling achievement values where they are absent. These are lofty goals in a world where there is much inequity in income, lifestyle, and education. Raising kids is challenging in the best of circumstances; just getting dinner on the table after work can be exhausting. But even families from affluent homes struggle to find time for family when screen time takes over or heavy work schedules make direct parental attention scarce. A good story is captivating even to unpracticed readers. A friend of mine volunteers at a juvenile hall a couple of times a week, reading books for incarcerated teens. Many of these kids have never been read to. She tells me that in the five years she has done this, no kid has complained. Many are there for weeks at a time and so they hear bits of the stories and look forward to the reading even without the benefit of continuity of the story. David Brooks is saying something important: raising kids who possess the necessary skills to find jobs or go to college requires not only affordable educational opportunities but family involvement as well. What can you do to help your child in school? 2. Talk about what you read. Discuss what the characters might have been feeling or doing.Reflect on the stories together. 3. Continue reading as a family; take turns reading aloud to each other. There are many young-adult (YA) books that are great for adults—look at the worldwide popularity of Harry Potter among readers of all ages. My daughter’s bookshop holds an adult book group that meets monthly just to read YA titles. 4. Download books or borrow the audio CDs from the library and listen to them on car rides and in place of video games, movies, or TV. 5. Make a place for study and homework (this could be just the kitchen table) that is a dedicated quiet area: TVs and smartphones off. 6. Limit and monitor all screen time, including texting, gaming, and Facebook. Screens can consume inordinate amounts of time for all family members, but just as in marriage, turning away from preoccupations and toward your child in little and big ways every day will help them feel loved. 7. Make a family plan about how much is okay and stick to it—adults, too. Some families do well by limiting TV/screen time to one hour a night once all schoolwork is complete, but not too close to bedtime. Save the hour before bed for quiet time—reading or listening to books—or talking about the day together. 8. Keep growing and learning through hobbies, reading, classes, or learning to play music. Follow your own passions and your child will see that learning throughout the lifespan is valued. 9. Never let your kid have a TV in their bedroom. This will surely lead to nighttime TV, inappropriate shows, or staying up late—leading to trouble getting up for school the next day. 10. Eat together several times a week. Having dinner conversations that are not forced or stiff is a skill. Don’t just talk to your kids but to your partner as well. We weren’t always perfect but we tried to follow these guidelines, and now we are enjoying our daughters as they graduate from college—entering the next chapter in their lives.